Fishing Report: No current report. Boat Ramp– Boat ramp is open and the wedge dock is in place. Park Fees: The gate staff is no longer staffed. Please use the self pay envelopes for park entrance and camping fees. Day-Use: Pinery day use is closed but will open soon. Highland day use is open. Campground: Juniper is open and has power however water and showers are unavailable at this time. Riverside campground is closed but will open soon. Crandall, Twin Coves and Cottonwood Campgrounds are open and first come first serve. Please pay by envelope at the entrance and display the tag on your dashboard. Fire Restrictions- Fires are allowed in designated fire pits, all campsites have fire pits. Rockport Reservoir (also called Wanship Reservoir) is a large lake located on the Weber River midway between Kamas and Coalville. 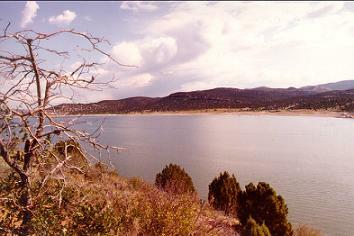 The reservoir shoreline is owned entirely by the state of Utah. Public access is unrestricted, but fees are charged to use park facilities. Rockport is a popular ice fishing destination, especially for Perch enthusiasts anxious to catch lots of tasty Yellow Perch through the ice.